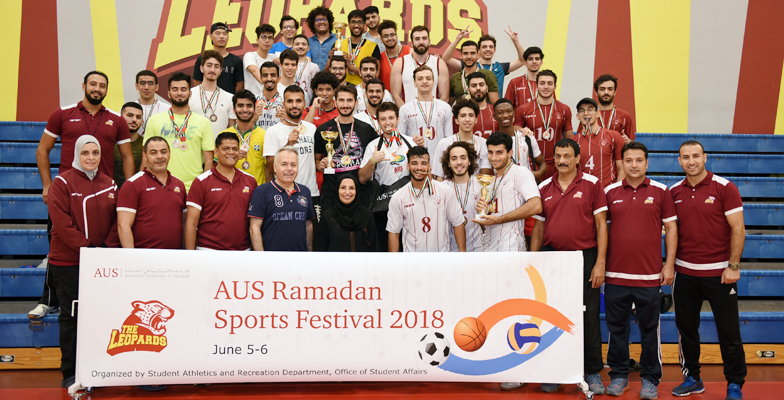 An action-packed program of activities kicked off the AUS Ramadan Sports Festival 2018 on June 5. Around 120 students descended upon the Sports Complex to join in the fun. Six entertaining sporting events were staged during these two nights with the male students invited to take part in futsal, volleyball, streetball and swimming, with female students enjoying water volleyball and table tennis competitions. The semifinals and finals were held on June 6. Mohamed Essam bagged two gold medals, Amgad Mahmoud won two silver medals and one bronze medal, and Zainuddin Ahmed won three silver medals in the men’s swimming events. In women’s table tennis, Ayesha Ismail won the championship. The festival also featured water volleyball as a recreational event for the female students. Zain Team won the men’s streetball championship, and Ammar AlAli was awarded the Most Valuable Player. The Extreme team won the men's volleyball championship, and Ihsan Al-Hayek was declared the Most Valuable Player. The festival’s most popular activity was the men’s indoor soccer competition in which 10 teams participated. The Tolbanators won the championship after an amazing comeback in second half against the Zidan Team. Ayub Al Mounjouni was awarded the best player of the tournament. Zain Katerji was named the best goal keeper and Mohammed Kyuare was the top scorer of the tournament. Dr. Moza, Dean of Students, presented the medals and trophies to the winners in the prize distribution ceremony.